The Miniature Pinscher (Zwergpinscher, Min Pin) is a small breed of dog, originating from Germany. The breed's earliest ancestors were a mix of Italian Greyhounds and Dachshunds. The international kennel club, the Fédération Cynologique Internationale, lists the Miniature Pinscher in Group 2, Section 1.1 Pinscher, along with the Dobermann, the German Pinscher, the Austrian Pinscher, and the other toy pinscher, the Affenpinscher. Other kennel clubs list the Miniature Pinscher in the Toy Group or Companion Group. The Miniature Pinscher is colloquially known as the "King of the Toys". Although the Miniature Pinscher and the Doberman are similar in appearance, the Miniature Pinscher is not a "Miniature Doberman"; it predates the Doberman by at least 200 years. The Doberman Pinscher was bred by Karl Frederich Louis Dobermann in 1880, and Dobermann had noted that he was looking to create a dog resembling the Miniature "Zwergpinscher" Pinscher but 15 times larger. 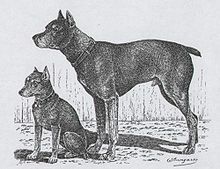 In 1895, the Pinscher Schnauzer Club officially recognized Dobermann's Pinscher, and they also officially recognized the Deutscher Pinscher (German Pinscher) as a separate breed from the Standard Schnauzer as well as the "Reh" Pinscher giving it the official name Zwergpinscher. The misconception that the Miniature Pinscher is a "miniature doberman" occurred because the Doberman Pinscher was introduced to the US before the Miniature Pinscher. In 1919 the Miniature Pinscher was introduced to the AKC show ring. At the time, not knowing that it was referred to officially in Germany as the Zwergpinscher (dwarfpinscher), the AKC referred to the breed as simply "Pinscher" and listed it in the miscellaneous category. When the Miniature Pinscher Club of America (MPCA) was created in 1929 (the year of the breed's official introduction into the AKC), they petitioned for Miniature Pinschers to be placed in the Toy group. This was unfortunate as no one with the MPCA nor AKC took the time to research the breed correctly and place it where it had been shown for one year, in the Terrier group. Unfortunately, the AKC's description, that the dog "must appear as a Doberman in miniature", led to the misconception common today that this breed is a "Miniature Doberman Pinscher". The original name for this breed in the US was "Pinscher" until 1972 when the name was officially changed to Miniature Pinscher. The original Miniature Pinscher was not a true house pet but a working breed left to the barn with minimal human contact, much like feral cats. This may have contributed to the unique independent trait in the breed that is still found today. Historical artifacts and paintings indicate that the Min Pin is a very old breed, but factual documentation begins less than 200 years ago, which leaves the breed's actual origins open to debate. In 1836 (the oldest documented writings on the breed history of the Miniature Pinscher) Dr. Reichenbach[unreliable source?] determined that the Miniature Pinscher was developed from crossing a smooth-coated Dachshund (a favorite German breed of the time with excellent ratting skills) with an Italian Greyhound. Many since that time have speculated as to other possible breed stock but there has been no documentation to support any other breeds. In all likelihood the now extinct Black and Tan German Terrier was used to create many of the German breeds, such as the Dachshund, which has led some to believe it may have other breed stock involvement.